I started off having no idea what to write about. I was sitting at work, turning ideas over in my head and shooting each of them down in turn. Then I had the idea of looking of Tom Wilhelmsen's curveball. I went to the Fangraphs website to look upon numbers and see if I could make anything of them. Somehow, I wound up looking at Carter Capps and Stephen Pryor. I don't know how I did it, but I did. I know it's the offseason and people are clamoring for news and/or posts concerning Nick Swisher and Josh Hamilton. Well that's not going to happen. Since Jack Z has yet to welcome me into his inner circle, the only thing I know for sure is that the Mariners are looking at them. Those two and just about every other baseball player that can swing a bat and wind up with some sort of positive outcome more than average. So instead, you get a post about the two hard throwing right handers in the Mariners bullpen. Not right now, since there are no baseball games being played in big league stadiums. By the way, f you couldn't tell by the title, this is strictly fastball talk. None of them bendy type pitches in this here post. First up we have Carter Capps. Mainly because I decided to write about it while on his page and the browser hasn't changed. In 2012, Capps threw 390 fastballs and 81 curveballs. There's also a cutter in there, but since it's one out of 472 pitches, we'll ignore it. You might think 472 pitches is a lot, and it is for us amateurs, but that's roughly 4+ starts for a starter, and half a season for a reliever. For all intents and purposes, it's a small sample size. With that in mind, I don't really care if it's a small sample size. Numbers are interesting because it's the middle of November, there's no meaningful baseball being played and there is nothing to report yet. Hopefully this helps to keep people from going too crazy during these winter months. I decided to look both at the Fangraphs and the TexasLeaguers PitchF/X page for Capps. Between the two, I think we can paint a decent picture. Probably something a little better than stick figures. While he was on the mound, 25.69% of at bats ended in a strikeout. That's not quite a strikeout an inning, but it's close. Keeping in mind, he's all of 22 years old and is only going to get better. On the mound, Capps threw 390 fastballs, averaging 97.8 mph. He threw his fastball 82.8% of the time. When you're throwing gas, you can get away with it for half a season out of the 'pen. Even with that kind of velocity, batters swung at 50.8% and made contact a total of 75.8%. 3 out of every 4 fastballs the batter swung at, he made contact. If you take those numbers and do the math, out of 390 fastballs thrown, 198 were swung at and 150 make contact with the bat. According to TexasLeaguers, 23.5% of those were fouled off and 15% put in play. No, the math doesn't quite add up because the two sites have the pitch type set up differently. Even so, he was a little better than league average when missing bats, just with his fastball. For the TexasLeaguers site, Capps threw 374 fastballs with the 23.5% and 15% stated in the last paragraph. The two sites do agree that he only threw one cutter, so there's that. At any rate, his fastball is an obvious weapon and could become even better once he can harness it and throw it for strikes, which was his biggest struggle. That's not really surprising, since most young flamethrowers haven't really harnessed it yet. With a 98 mph fastball, that's not entirely a big deal. Hey, maybe he'll accidentally hit the Mariner Moose one of these days and scare the crap out of the other team. Bull Durham is not a movie minor leaguers should watch. We move on to Stephen Pryor. Another young flamethrower that can give you a haircut with his fastball. Not sure you'd want him to try though, since he's still a little bit wild with his fastball. Same applies to him as it does to Capps. A young dude that throws hard isn't going to have pinpoint accuracy with his pitches quite yet. With an average of 96.2 mph, I guess you don't HAVE to throw strikes too terribly often. Pryor threw 430 pitches in 2012, with 313 of them being fastballs, good for a 72.8%. He mixes in a slider the other 27.1% of the time, which is not a pitch to write home about just yet. At bats ended in a strikeout 25.96% of the time, nearly identical to Capps. With the fastball, batters swung 48.6% of the time (about average) and made contact 77% of the time. He and Capps are about equal on the swinging and making contact front, which makes the whole bullpen thing kind of exciting. On the TexasLeaguers side of things, 304 of Pryor's pitches were fastballs, 23% of which were fouled off and 13.2% put in play. The difference of 9 pitches between the two sites isn't a Grand Canyon sized gap, so taking the numbers at face value wouldn't be a math sized tragedy. The two sites tell basically the same story. These guys can throw gas and are still a little on the raw side. 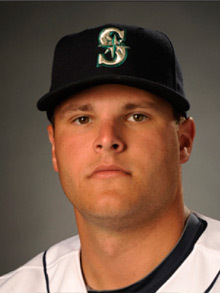 Between Capps and Pryor at the back end with Wilhelmsen, the future for the Mariners bullpen is looking up. Both Capps and Pryor have their fastballs as very good weapons already, and when they develop their secondary stuff, look out. Hopefully these guys stay with the team for quite a while and we get a chance to watch them develop into the dominant pitchers they're already poised to be. They didn't set the league on fire this past season, but seeing the radar gun light up and looking at a few of the numbers behind those arms, it's only a matter of time.